Aluminum is the most valuable of household recyclables. Each can is able to be recycled over and over again, saving energy, eliminating the need for strip mining, and reducing landfill contribution. Unfortunately, of the more than 100 billion aluminum cans sold in the United States each year, less than half are recycled. 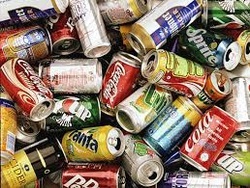 If you don't have curbside recycling or you just want some extra cash, collect your aluminum cans and cash them in! Below are some local places in Columbus Ohio or search Earth911 for a place near you. There are numerous places in Columbus that will recycle your cans in exchange for cash. We suggest calling before heading to any of the addresses listed below. You will want to confirm that you will receive money and how much per pound they offer.